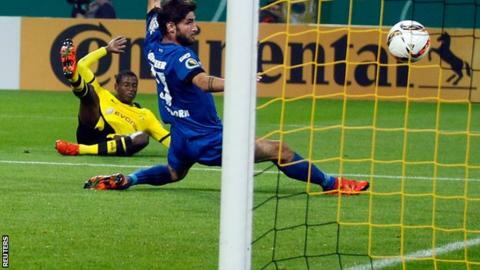 Borussia Dortmund recovered from an early setback to thrash Paderborn for a place in the German Cup third round. Srdan Lakic gave the visitors the lead when he punished a mistake by keeper Roman Burki, but moments later Adrian Ramos levelled with an angled shot. Gonzalo Castro sidefooted in, Shinji Kagawa scored a great solo goal and Ilkay Gundogan converted from the spot. Castro slotted in another, before Henrikh Mkhitaryan and Lukasz Piszczek fired in twice more late in the game. Dortmund have now scored 61 goals in 19 games this season since Thomas Tuchel replaced Jurgen Klopp as boss.